Night Sky Farm milks 25 dairy does and 2 Jersey cows and with their milk the cheese room creates fabulous cheeses! 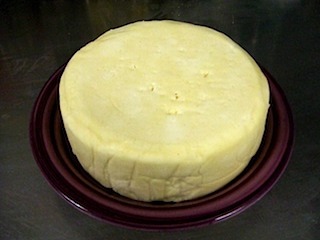 We offer Fresh-Pressed cheeses made from either cow or goat milk: Cheddar, Feta, Gouda and Havarti. Some are made in individual 5 - 6 oz. rounds others are hand-cut from larger 2 pound wheels into 5 oz. sized pieces. 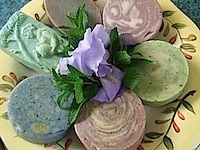 Sometimes herbs such as fresh dill are blended into the pressed cheeses. 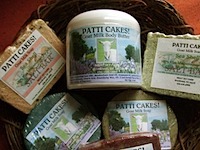 Feta is sold - 7 oz net in 8 oz jars either in Sea Salt Brine or in Marinade. Our Marinade is made with Extra Virgin Olive Oil, Pot Herbs from the garden and sometimes includes Kalamata Olives, Fresh Basil in season or Sun-Dried Tomatoes. Our feta is a traditional soft curd feta that gets crumblier while aging in the salt brine. FETA IS JUST PLAIN GOOD ON EVERYTHING! Separating the cream from the goat milk. Cream is on the right! 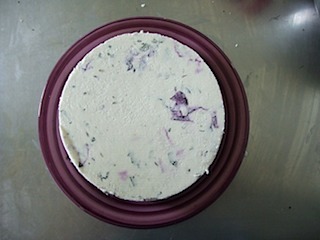 Night SKy Farm Butter is hand-made on the farm with the sweet cream of the cow or goat milk. 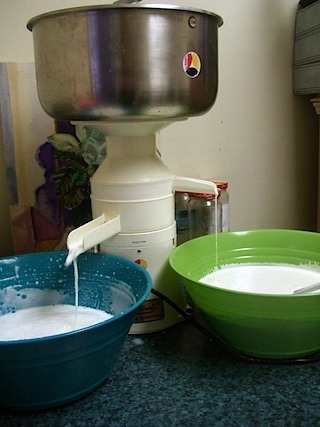 The goat cream is obtained through the cream separator and the cow cream is skimmed off the gallon. All of our butter is sweet cream and lightly salted with sea salt. 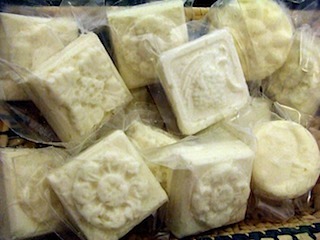 Sold in 3.5 oz pretty molded bars, vacuum sealed and frozen is perfect to decorate and enhance your dinner table. This is not your ordinary butter. To purchase any of our Fresh-Pressed Cheeses or Butter, you can go through our website, click on the cheese picture on the home page. Not all varieties are available online. Or you can call the farm and order over the telephone (WE CAN ACCEPT MAJOR CREDIT CARDS OVER THE PHONE). Or you can send an email and I can invoice you through PAYPAL. No Shipping during the very hot months of summer unless you agree to EXPRESS SHIPPING. At all other times we ship USPS Priority Mail with ice blocks.